Unless you change Outlook’s AutoArchive settings, Outlook does not archive your items automatically. Some businesses, however, might have it enabled for their users. Other companies might instead use an autodelete service to purge old messages, but check your company’s email retention policy before you make any changes to the AutoArchive settings. Select the File tab and click the Options button. The Outlook Options dialog box opens. Click the Advanced button in the Navigation pane on the left. 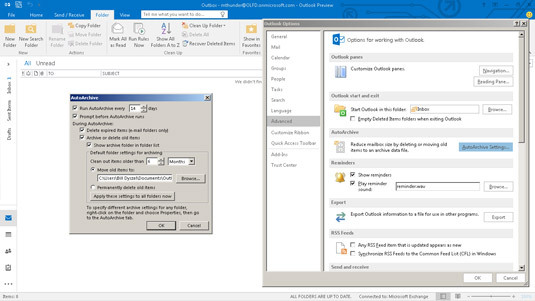 The options for working with Outlook pages appear. In the AutoArchive section, click the AutoArchive Settings button. The AutoArchive dialog box opens. If you turn on AutoArchive without changing any of the other AutoArchive settings, Outlook automatically archives items every 14 days, sending items that are more than six months old to the archive file listed in the AutoArchive dialog box. For most people, those settings are just fine. Some people prefer to turn off the AutoArchive feature and run the archive process manually. You can turn on or off the AutoArchive process by selecting or deselecting the Run AutoArchive Every check box at the top of the AutoArchive dialog box. You can also change how often AutoArchive runs by replacing the 14 in the text box with any number between 1 and 60. If all you do is turn on AutoArchive and make no other changes here, you might be surprised to find out that your Inbox — as well as some other folders — will not be autoarchived. Each folder has its own AutoArchive settings, which can be different from other folders’ AutoArchive settings. If you want to autoarchive all your folders with identical settings, make sure to also click the Apply These Settings to All Folders Now button in the AutoArchive dialog box — that is, all folders except for the Contacts folder, which can’t be archived. Autoarchiving all your folders might not be a great idea if you never clean out your Deleted Items or Junk Email folders — you’d wind up archiving lots of spam and deleted messages.